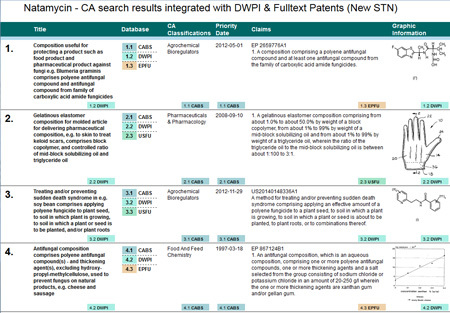 1 September 2015 — Chemical Abstracts Service (CAS) and BizInt Solutions, Inc. are excited to announce a collaboration empowering search professionals using new STN to seamlessly transition from precision searching to customized reporting and analysis for Intellectual Property (IP) research, discovery and decision support. Today’s launch of BizInt Smart Charts for Patents 4.0 and the August 1 launch of the latest version of new STN make this possible with the introduction of a new data transfer format that optimizes integration of STN search results into the culminating, post-search analysis stage of the IP search workflow. BizInt Smart Charts for Patents enables individuals to aggregate, examine, refine and act upon information from myriad patent information resources. New STN, operated jointly by CAS and FIZ Karlsruhe worldwide, is a modern, web-based search solution for IP professionals, offering access to essential, curated content through an intuitive, project-oriented interface. By linking the reporting and analytical expertise of BizInt Smart Charts with the unparalleled content and search power of new STN, search professionals can now more effectively find the answers and insight needed to drive sound business decisions. "STN provides access to the most complete collection of high value patent and related sci-tech content in the world, and as such, is the preferred platform for professionals to make informed business decisions to protect intellectual property," said Chris McCue, CAS vice president marketing. "Now, with BizInt Smart Charts, this innovative new workflow solution enables STN users to more efficiently analyze, integrate, and share the high-quality, business-critical information they get from STN, significantly increasing the value of that information across their entire organization." BizInt Smart Charts for Patents 4.0 supports new STN value-added bibliographic databases, including CAplusSM and Derwent World Patents Index® (DWPISM) from Thomson Reuters, non-patent literature databases and all full-text patent databases. Support for additional databases, including substance and structure databases, will be added in upcoming releases of BizInt Smart Charts. "Innovation-focused organizations around the world have used BizInt Smart Charts and STN for years to create high-quality, customized reports integrating data from IP databases," said Diane Webb, president of BizInt Solutions, Inc. "We are pleased to work with the STN development team to deliver an enhanced experience to our mutual user community, and we look forward to extending the benefits of BizInt Smart Charts for Patents to more STN users." Click here for more details on exporting from new STN to BizInt Smart Charts. 19 April 2015 —At the 2015 SLA Pharmaceutical & Health Technology (PHT) Spring Meeting in Las Vegas, BizInt Solutions is announcing a new product, BizInt Smart Charts for Clinical Trials, in the BizInt Smart Charts product family. BizInt Smart Charts for Clinical Trials is scheduled for release in late summer 2015. Support for clinical trials databases – including ClinicalTrials.gov, Citeline TrialTrove, Adis Clinical Trials Insight and Thomson Reuters Cortellis – will be moved from BizInt Smart Charts for Drug Pipelines to the new BizInt Smart Charts for Clinical Trials product. BizInt Smart Charts for Clinical Trials will also add support for the European Clinical Trials Database (EudraCT) and World Health Organization International Clinical Trials Registry Platform (WHO ICTRP). BizInt Smart Charts for Clinical Trials will allow customers to create tabular reports and combine data from the supported clinical trial databases. Related trials across databases can be identified using the “Identify Common Trial ID” tool and related trials can be summarized in a single row with the BizInt Smart Charts Reference Rows utility. Coinciding with the release of BizInt Smart Charts for Clinical Trials, pricing will be aligned across the BizInt Smart Charts product line. All three products – BizInt Smart Charts for Drug Pipelines, BizInt Smart Charts for Clinical Trials, and BizInt Smart Charts for Patents – will be priced at an annual license fee $2500 for the first user and $1200 for each additional user. New product suites, site and enterprise licenses will provide customers a discount for licensing multiple products. Watch for more details in the next few months. Current customers who have questions about how their license will be affected by these changes are encouraged to contact BizInt Solutions at support@bizint.com. A new Tools|Compare Columns command lets you quickly spot the differences between two columns. We've added the Tools|Create Subtable command to BizInt Smart Charts (previously it was only available in Reference Rows), and the Statistics tool is now available on the right mouse menu. BizInt Smart Charts Reference Rows Version 1.2 includes the ability to import data from VantagePoint - Smart Charts Edition. The latest version of Reference Rows also includes a new rule to summarize the values in cells while removing duplicates. BizInt Smart Charts for Patents 3.7 includes support for EMBAL and PQSCITECH on STN, Legal Status and user-defined fields from Orbit.com, and we've also fixed Author and Affiliation import from many files on STN. Finally, you may have noticed that we have updated the BizInt.com homepage. Hopefully you will find it easier to find the information you need. We're Listening - feel free to send your suggestions for the continued improvement of BizInt Smart Charts to support@bizint.com. Improved integration with VantagePoint - Smart Charts Edition. BizInt Smart Charts Reference Rows 1.1 which includes an Excel export as well as the ability to summarize values in related records. BizInt Smart Charts for Drug Pipelines 3.6 includes enhanced support for Clinical Trials data from a number of sources. BizInt Smart Charts for Patents 3.6 includes support for Legal Status from many of our supported databases, and initial support for biomedical literature on ProQuest Dialog. Redesigned interface in Step 3 of the File|Combine and File|Update wizards. New View|Columns panel makes it easier to select and rearrange columns. BizInt Smart Charts Reference Rows utility automatically installed (as an option) when you install the latest 3.5 software. BizInt Smart Charts for Patents: Support for DGENE, PCTGEN, and more literature databases on STN. 21 December 2011 -- BizInt Solutions, Inc. is pleased to announce the release of BizInt Smart Charts Reference Rows™ 1.0. BizInt Smart Charts Reference Rows is included at no additional charge as part of BizInt Smart Charts for Patents and BizInt Smart Charts for Drug Pipelines licenses. Reference Rows is a separate application which is downloaded and installed on each BizInt Smart Charts user's desktop. 9 November 2011 -- BizInt Solutions, Inc. is pleased to announce an agreement with Search Technology, Inc. to develop and market a custom version of VantagePoint for use by BizInt Smart Charts customers. VantagePoint – BizInt Smart Charts Edition will import files exported by BizInt Smart Charts for Drug Pipelines or BizInt Smart Charts for Patents, using a custom version of the new XML Smart Data Exchange format. BizInt Smart Charts users can apply data cleaning and user-managed thesaurus tools in VantagePoint and then export cleaned and normalized fields back to BizInt Smart Charts. "I am very excited by the potential of VantagePoint to offer BizInt Smart Charts users powerful features for normalizing and enhancing data in multi-database reports," said Diane Webb, President, BizInt Solutions, Inc. "Especially used in conjunction with our new BizInt Smart Charts Reference Rows utility, VantagePoint will help our users create truly meaningful multi-database reports, with consistent values across databases." VantagePoint – BizInt Smart Charts Edition will contain VantagePoint's core analytics suite including market-leading Data Cleanup, Thesaurus, Record Classifications, My Keywords, and interactive analytical visualizations. Data exchange between the two tools will be simplified to make it easy to move data back and forth, allowing the user to concentrate on analysis and reporting, rather than managing data flow. "VantagePoint and BizInt Smart Charts are an ideal pair for the Information Professional – powerful analytics with flexible data integration and reporting," said Paul Frey, President, Search Technology, Inc., developers of VantagePoint. "We are delighted to work with BizInt Solutions to bring this streamlined solution to the Drug Pipeline and Patent information markets." VantagePoint – BizInt Smart Charts Edition will be sold by BizInt Solutions as part of a BizInt Smart Charts license. Annual license pricing will be $3000 for the first user and $1600 for additional users in the same license. The expected release date is summer 2012. BizInt Solutions, in conjunction with the Vantage Point team at Search Technologies, has defined a new XML format for exchanging data between post-processing tools. This XML Smart Data Exchange format allows users to export the contents of a chart in a format which can be easily loaded into other tools, such as Vantage Point v. 7. You can perform analysis, clustering, database lookups, or other operations using those tools, and then return the results of your analysis to BizInt Smart Charts to be included in your chart. Preliminary user documentation is available, as is a description of the XML format itself. Please let us know if you are planning to implement the XML, and the spec is still subject to small changes. This new export is available in BizInt Smart Charts for Patents (starting with version 3.4.7) and BizInt Smart Charts for Drug Pipelines (starting with version 3.4.5).